The works of Federico Fellini almost universally fall into two categories, regardless of their subject matter and time of release: surreal and abstract. Granted, those descriptors sound similar in concept and there's certainly a bit of overlap between the two, but there's a distinction between the categories that can have a significant impact on the tone and intention of the director's work. Fellini often explores surrealism, in which scenes, locations, and events contain a dreamlike or elevated-reality property, though genuine events can and do transpire within those boundaries. His other, more adventurous films explore ideas that require abstract thought and connecting-of-dots for them to really make sense, though the audience can still simply observe the imagery and appreciate it for the craftsmanship if necessary. Naturally, both surrealism and abstraction can entwine in Fellini's work, and it's fitting that his final film, The Voice of the Moon (La voce della luna), infuses both into ruminations on society and longevity, though the auteur's intentions unfortunately and uncharacteristically get lost in its overly cryptic and disjointed vignettes. In particular, The Voice of the Moon is a struggle to describe in terms of actual plot, one that's loosely based on the novel The Lunatics' Poem written by Ermanno Cavazzoni just a few years prior. The main character is Ivo Salvini (Roberto Benigni), a mid-30s, relatively young man who has recently been released from a mental institution. While wandering the Italian countryside, he discovers and builds an infatuation for Aldina (Nadia Ottaviani), a radiant woman whom he believes to be a human embodiment of the moon. Ivo's journeys through the countryside and into the nearby cityscape send him through dreamlike locations and situations, causing him to interact with a medley of peculiar individuals: an eccentric oboe player who enjoys camping out in a graveyard with his wife; a patron at a salon and the mentally off-kilter hair stylist whom he chooses to marry; and a regional magistrate, Gonnella (Paolo Villaggio), who lost his job due to age-dependent mental issues. Turns out, they all share something more in common than they suspect, becoming evident in Ivo's travels. There's the belief that the details and explanations of arthouse films shouldn't be "spoon-fed" to those watching, but one shouldn't neglect the other side of that conversation: that it's tough to appreciate the moving parts of an interpretation-heavy film without a few clear, blatant details to work with. Upon the first glimpses at a water well in moonlight, shimmying women working in the fields, and Ivo's emergence amongst a pack of peeping toms at a farmhouse, it's difficult to know what to make of the world that Fellini's creating in The Voice of the Moon. For a long while, one can only run on the suspicions that something isn't precisely right under the glow of the moon, partly because Fellini constructs the atmosphere with a hazy blend of reality and quasi-fantasy that leaves one scouring for details and clues. Where the director's careful elevation of reality succeeds in prior works, he stumbles in the grounded aimlessness of Ivo's wandering and encounters, searching for meaning without the context to appreciate the journey. The volume of characters interwoven in The Voice of the Moon also isn't anything new to Fellini's work, but his focus too briefly concentrates on the individuals within his episodic explorations here, not allowing the substance of their interactions to set in. Chief of them being Roberto Benigni's lead character, Ivo, who serves as an observer and commentator instead of someone genuinely interacting with the denizens of this uncanny landscape. If their story doesn't have to do with his deepening infatuation for Aldina, then he isn't terribly interested at first, with Benigni's aloof style of dramatic delivery concealing the character's more emotive responses. Other people he interacts with are intriguing but superficial depictions of their personality types, from the quirky oboe player to the paranoid government overseer who educates Ivo on the underlying realities about this world he's experiencing. The Voice of the Moon walks and talks like Fellini's past work, but the scattershot and self-focused quality of the characters' dialogue keeps the vignettes from forming into a cohesive portrait. On an existential level, The Voice of the Moon more closely resembles the abstract contemplations of Fellini's Juliet of the Spirits or Roma, tying seemingly unrelated occurrences together into an understanding of the standoffish presence of the world around Ivo. The execution here frustrates more than absorbs, though, with elements such as a lengthy rave sequence in a warehouse and an even lengthier stretch of people watching events transpire on a big screen that cause the film's visual language to meander. So, too, does one's willingness to puzzle out what Fellini's attempting to convey with his fragmented musings about both life and the beyond, a collage of poetic representations that reflect upon the frustrations people have with society's growing disconnect from individuality itself. The Voice of the Moon revolves around a poignant message for the director to depart on, and his craftsmanship of wistful scenery and whimsical anecdotes can still be felt throughout, yet its esoteric and drifting abstractness keeps Fellini's final surreal lyricisms from reaching the same heights. 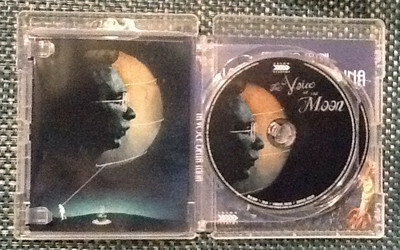 Arrow Video have presented The Voice of the Moon in a highly attractive two-disc clear case that's become customary for the label, featuring a newly commissioned cover design from artist Peter Strain that can be reversible. A standard DVD Copy of the film has also been included. Inside, a Booklet covers the cast/crew and description of the restoration, alongside an essay, "Fellini's Swansong" by Pasquale Iannone. Because of the film's cryptic nature and despite it being FedericoFellini's swan song, The Voice of the Moon struggled to find a distributor in the US, leaving many western viewers unable to see the film until it could appear on home-video … which didn't pan out either. Therefore, this Blu-ray from Arrow Video marks one of the first times that many have been able to see the director's final work, and predictably the boutique label has done a remarkable job with their exclusive restoration, a 1.66:1-framed, 1080p AVC treatment from a 2K remaster derived from the original 35mm camera negative. A hearty, natural veil of film grain commingles with the image throughout, but it never gets in the way of fine details, allowing the curvature of glasses, the earthy textures at a cemetery, and blades of glass to stand out with authentic clarity. 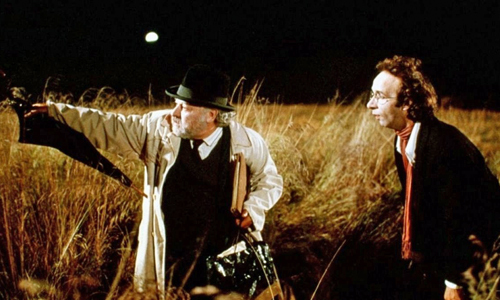 A lot of the film transpires at night or in dark sequences, underneath the moon or within the hazy space of a nightclub or elsewhere, and the contrast balance remains stable and credible throughout. Flesh tones are supple yet mindful of when they need to be extra pale, while a handful of warm color shades emerge from the mostly restrained palette. The grain and compression might be too heavy in a few spots, but aside from that, this restoration is tremendous. The mono Italian DTS-HD Master Audio track doesn't have the allure of the restoration, but it's a sturdy and engaging sonic presentation, derived from the original optical soundtrack negative. Strong sound effects are quite rare, and the ones that do emerge -- the stomping of feet on a hardwood floor, the shrill sounds of shock from a woman, the rattle of a train -- are merely serviceable in fidelity and clarity. Of course, the bulk of the film revolves around dialogue and music, which sound serviceably clear and balanced against the rest of the track. Perhaps the most impressive moment in the film comes in a rave sequence where people are dancing to a Michael Jackson song, and the subtle, haunting resonance of the echoes are well-captured in the monaural track. The included booklet goes on to discuss the problematic synching of the dialogue, and it can certainly get distracting, but that's inherent in the source material. Most importantly, distortion is kept at a minimum and the middle-range presence of the film accomplishes plenty. The English subtitles are, naturally, quite eloquent and grammatically sound. 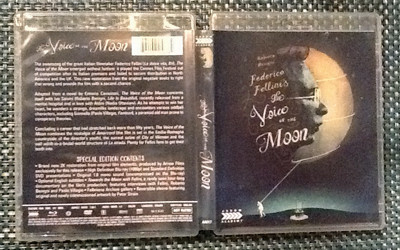 The sole extra made available for The Voice of the Moon is a peculiar, almost narrative-based piece called Towards the Moon with Fellini (59:32, 4x3), which involves the secretive production of Fellini's "latest" film. Interviews with the cast and crew -- including many shots of Fellini at-work -- are scattered throughout the quasi-documentary, but the strange essence of secrecy surrounding the film and the slightly in-character chats with the filmmakers transform it into an unusual watch for those merely wanting to absorb the construction aspects of the film, considering it's the only real supplement. Instead, it's more interesting to absorb the hustle-‘n'bustle that went into many intricate, involved scenes of crowds and other visually ornate elements. Arrow Video have also included the Felliniana Archive Gallery, which is comprised of stills and posters. It's uncommon for someone to appreciate Federico Fellini's entire body of work, considering the fluctuations in how surreal and abstract he can make his films, making some effortlessly coherent and others deliberately complex. In any instance, the final film from Fellini should've garnered some interest in distributing it in the west regardless of the film's quality, and the fact that The Voice of the Moon was avoided for so long might be an impartial sign of its standing among the auteur's works. Both dreamlike and willfully abstruse, his depiction of an ex-mental patient wandering an existential countryside and interacting with neorealistic scenarios lacks an interpretive anchor. Deciphering what's really going on becomes a chore, which isn't aided by the cursory nature of the characters and situations throughout, despite their reflective nature upon the fragments of Fellini's life. It's a dozer of an arthouse piece, and that's certainly tough to do with Roberto Benigni in the lead. Arrow Video have certainly presented it in a fine package, though, sporting exceptional audiovisual properties and containing a unique legacy doc about the film. It's worth seeking out for a Rental, yet there's little return value here.